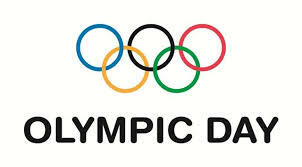 June 23 marks the worldwide celebration of Olympic Day. On 23 June, the International Olympic Committee (IOC) and the Olympic Movement are celebrating [the] 65th Olympic Day! The IOC celebrated its first World Olympic Day on 23 June 1948 with nine National Olympic Committees hosting ceremonies in their respective countries. Today, Olympic Day has evolved to become a key date in the Olympic Movement’s calendar and has gained momentum worldwide with last year, almost 4 million participants from around the world and over 150 National Olympic Committees (NOCs) taking part. The official page for Olympic Day also provides an interactive map of the NOCs taking park, and a cool video featuring Kobe Bryant encouraging participation. Here in the United States, there's a Team USA directory of participating communities -- it's not too late to participate like 2010 Vancouver Olympian/Sochi 2014 Olympic hopeful Julia Clukey and participants did at the camp she created in Maine. 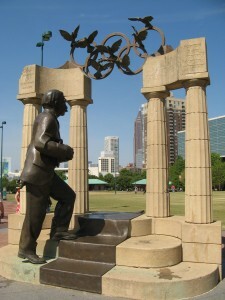 I plan to participate by taking a brisk walk from Midtown Atlanta to downtown's Centennial Olympic Park, home of the statue honoring modern Olympic founder Baron Pierre de Coubertin. Hope you will also make it an Olympic Day.